3) Rates of growth in the recovery cycle are in excess of pre-recessionary growth. These facts are patently absent from the data for the major advanced economies today, some four to five years into the recovery. This realization has prompted some economic and financial analysts to speculate about the potential structural decline in long term growth rates, the thesis commonly termed "secular stagnation". Currently, there are two prevailing theses of secular stagnation, linked to two long-term cycles gaining prominence in the global economy: the demand side and the supply side theses. The first theory suggests that secular stagnation is linked to a structural decline in aggregate demand, manifesting itself though a decades-long mismatch between aggregate savings and investment and more broadly related to the demographic effects of ageing. This theory traces back to the 1930s suggestion by Alvin Hansen that the U.S. Great Depression aftermath was coinciding with decreasing birth rates, resulting in oversupply of savings and a fall off in demand for investment. The thesis was salient throughout the 1930s and the first half of the 1940s, but was overrun by the war and subsequently forgotten in the years of the post-WW2 baby boom and investment uplift. Large scale increase in public investment, linked to rebuilding destroyed (in Europe and Japan) or neglected (in the war years in the U.S.) public infrastructure, helped to push Hansen's forecasts of a structural growth slowdown aside. The thesis of demand-driven secular stagnation made its first return to the forefront of macroeconomic thinking back in the 1990s, in the context of Japan. As in Hansen's 1930s U.S., by the early 1990s, Japan was suffering from a demographics-linked glut of savings, and a structural drop off in investment. Suppressed domestic demand has led to a massive contraction in labour productivity. 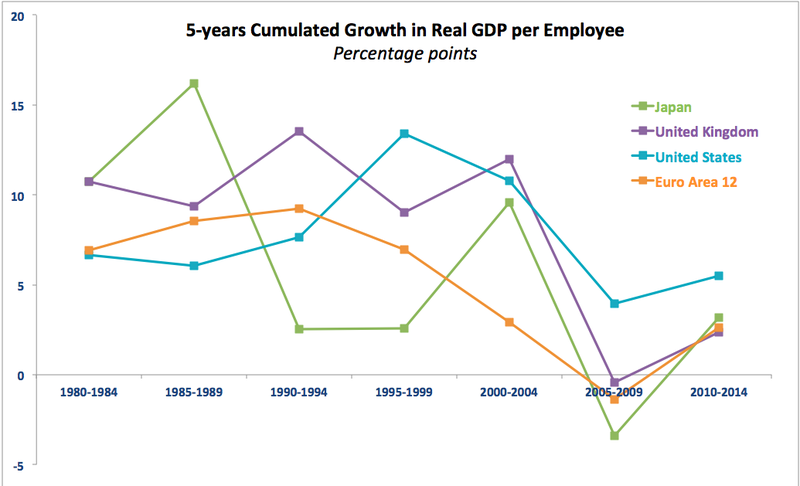 During the 1980-1989 period, Japan's real GDP per worker averaged 3.2 percent per annum. In the following decade, the rate of growth was just over 0.82 percent and over the period of 2000-2009 it fell below 0.81 percent. Meanwhile, Japan's investment as a percentage of GDP fell from approximately 29-30 percent in the 1980s and the 1990s to under 23 percent in the 2000s and to just over 20 percent in 2010-2015. Following Japan's experience and the shock of the Great Recession, the theory that the entire developed world is set for a structural growth slowdown has gained traction. Between 1980 and 2014, the gap between savings and investment as percentage of GDP has widened in Canada, Japan, and the Euro area. Controlling for debt accumulation in the real economy, the widening of savings surplus over investment over each decade since the 1980s is now present in all major advanced economies, including the U.S. In line with this, labour productivity also fell precipitously across all major advanced economies. As shown in the chart below, even a period of unprecedented rise in unemployment in the U.S. and the euro area over the recent Great Recession did not shift the trend for declining labour productivity growth. Worse, current zero rates monetary policy environment is reinforcing the savings-investment mismatch, rendering the monetary policy impotent, if not damaging, in stimulating the return to higher long term growth. Traditionally, low interest rates create incentives for investment and reduced saving by lowering the cost of the former and increasing the opportunity cost of the latter. However, today's ageing demographics and rising dependency ratios offset these 'normal' effects. This means that for the older generations, retirement pressures work through both insufficient reserves built in pensions portfolios, and also through lower yields on retirement portfolios, incentivising more aggressive savings. For the working age population, the pressures are more complex. On the one hand, middle age workers today face severe pressures to deleverage their balance sheets, aggressively reducing liabilities accumulated before the crisis. On the other hand, growing proportions of middle-age adults are facing twin financial pressures from the rising demand for support for ageing parents and, simultaneously, for increasing number of satay-at-home younger adults who continue to rely on family networks for financial and housing subsidies. A recent Pew Research study found that 64 percent of Italian middle-aged generations find themselves sandwiched between ageing parents and children. In the U.S. this proportion is 47 percent and in Germany 41 percent. All along, the same households are under pressure to build up their pensions, as retirement security and social provision of pensions are now highly uncertain. 6) Large scale holdings of banks' reserves on central banks balance sheets. All of these factors are currently at play in the U.S., UK and the euro area, as well as Japan. With a lag of about 3-5 years, they are also starting to manifest themselves in other advanced economies. The supply side of secular stagnation thesis is a relatively new idea coming from the cyclical view of historical development of physical and ICT-linked technologies. First formulated by Robert Gordon some years ago it is summarised in his August 2012 NBER paper, titled "Is the US Economic Growth Over? Faltering Innovation Confronts the Six Headwinds" (http://papers.ssrn.com/sol3/papers.cfm?abstract_id=2133145). Gordon looks at long-term - very long-term - trends in growth from the point of challenging the traditional view of macroeconomists that perpetual economic progress is subject to no time constraints. In Gordon's view, U.S. economy over the period through the 2050s is likely to face an uphill battle. Per Gordon, "The frontier established by the U.S. for output per capita, and the U. K. before it, gradually began to grow more rapidly after 1750, reached its fastest growth rate in the middle of the 20th century, and has slowed down since. It is in the process of slowing down further." The reason for this, according to the author, is the exhaustion of economic returns to the most recent technological / industrial 'revolution'. "A useful organizing principle to understand the pace of growth since 1750 is the sequence of three industrial revolutions. The first with its main inventions between 1750 and 1830 created steam engines, cotton spinning, and railroads. The second was the most important, with its three central inventions of electricity, the internal combustion engine, and running water with indoor plumbing, in the relatively short interval of 1870 to 1900. Both the first two revolutions required about 100 years for their full effects to percolate through the economy. …After 1970 productivity growth slowed markedly, most plausibly because the main ideas of [the second revolution] had by and large been implemented by then. The computer and Internet revolution began around 1960 and reached its climax in the dot.com era of the late 1990s, but its main impact on productivity has withered away in the past eight years. …Invention since 2000 has centered on entertainment and communication devices that are smaller, smarter, and more capable, but do not fundamentally change labor productivity or the standard of living in the way that electric light, motor cars, or indoor plumbing changed it." Gordon’s argument is not about the levels of activity generated by the new technologies, but about the rate of growth in value added arising form them. In basic terms, ongoing slowdown in the U.S. (and global) economy is a function of six headwinds, including the end of the baby boom generation-linked demographic dividend; rising income and wealth inequality; factor price equalisation; lower net of cost returns to higher education; the impact of environmental regulations and taxes; and real economic debt overhangs across public and non-financial private sectors. Gordon estimates that future growth in consumption per capita for the bottom 99 percent of the income distribution is likely to fall below 0.5 percent per annum over the period of some five decades. The supply-side thesis, implying persistently falling returns to technological innovation and resulting reduced rates of productive investment in technological capital, is supported by some top thinkers in the tech sector, notably the U.S. entrepreneur and investor Peter Thiel (see http://www.ft.com/intl/cms/s/0/8adeca00-2996-11e2-a5ca-00144feabdc0.html). A recent study from IBM, titled "Insatiable Innovation: From sporadic to systemic", attempted to debate the thesis, but ended up confirming Gordon’s assertion that incremental and atomistic innovation is the driver for today's technological progress. In other words, the third technological revolution is delivering marginal returns on investment: significant and non-negligible from the point of individual enterprises, but hardly capable of sustaining rapid rates of growth in economic value added over time. The problem is that both theses of secular stagnation are finding support not only in the past historical data, but also in the more recent trends. Even the most recent World Economic Outlook update by the IMF (April 2015) shows that the ongoing economic slowdown is structural in nature and traces back to the period prior to the onset of the Great Recession. As both, the demand and supply side theses of secular stagnation allege, the core drivers identified by the IMF as the force behind this trend are adverse demographics, decline in investment, a pronounced fall off in total factor productivity growth (the tech factor), as well as the associated decline in labour and human capital contributions to productivity. IMF evidence strongly suggests that during the pre-crisis spike in global growth, much of new economic activity was driven not by expansion on intensive margin (technological progress and labour productivity expansion), but by extensive margin (increased supply of physical capital and emergence of asset bubbles). Like it or not, to deliver the growth momentum necessary for sustaining the quality of life and improvements in social and economic environment expected by the ageing and currently productive generations will require some serious and radical solutions. The thrust of these changes will need to focus on attempting to reverse the decline in returns to human capital investment and on generating radically higher economic value added growth from technological innovation. The former implies dramatic restructuring of modern systems of taxation and public services provision to increase incentives for human capital investments. The latter implies an equally disruptive reform of the traditional institutions of entrepreneurship and enterprise formation and development. Absent these highly disruptive policy reforms, we will find ourselves at the tail end of technological growth frontier, with low rates of return to technology and innovation and, as the result, permanently lower growth in the advanced economies.